A brand new work and world premiere: Roman Women at the Palace of Fine Arts, April 27- June 3, 2018. Roman Women is a Theatre Bay Area Recommended Production! Children under 6 cannot be accommodated, see the FAQ below for more information. The Palace can be quite windy and surprisingly cold. Please be prepared with your warmest clothing! While this site is not as rugged as some of our previous locations, we do still suggest comfortable shoes and multiple layers. To help you carry the items you're not wearing, a small pack is handy, plus you can stash snacks and a water bottle. About one hour and forty-five minutes. Restrooms are accessible before the show begins, but not during the performance. How accessible is this production? This may be our most accessible site yet. Everything is flat and fully navigable by wheelchair. As with all We Players productions, our team will guide you through the space, and we encourage you to choose and change your position so you can best see and hear the action. In each performance location the audience will take the following formation: those comfortable sitting or kneeling on the ground in the front, those sitting on stools next, and those standing remain at the back. We will provide folding stools and foam kneelers for those who wish to use them. We can not accommodate personal folding chairs, please plan to use one of ours. My budget is very limited, how can I get discounted tickets? You can join the "Roman Women" Rush Ticket mailing list for a chance at last-minute half-price tickets if they become available. Or better yet - volunteer! Lend us a helping hand for a couple of shows and get free tickets! Email Melinda@WePlayers.org for details. This project looks really interesting! Can I volunteer with We Players? Absolutely! Join us in bringing magic to The Palace! Click here to learn more and sign up. Free parking is available in the E Beach lot off Javowitz Street, and the Yacht Road lot , each just a 5 minute walk from The Palace of Fine Arts at the northeast corner of the Presidio. Is this production suitable for children? This production explores the female experience and parents should be advised that to that end, this piece contains occasional strong, briefly graphic sexual language and insults and scenes of traumatic and abusive behavior. These scenes are not overtly violent but may be upsetting to some children and adults. Children under the age of 6 cannot be accommodated. For questions about the production and performance, please contact We Players at info@weplayers.org . 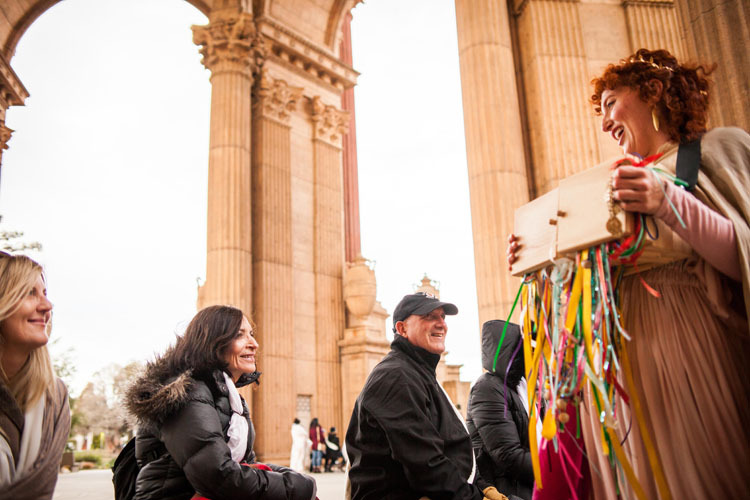 Place: Meet at the Roman Women check-in table on the north side of the Palace of Fine Arts. Free parking is available at the E Beach Parking Area off Javowitz Street and in another lot off Yacht Road. When archaeologists and historians write about the past, they traditionally use expository narratives in which the persona of the archaeologist - writer as well as his/her historic subjects remain anonymous or, at best, viewed as by a distant bird’s eye. How else can one write about the past where all that remains are fragmentary remnants of these ancient lives? Writers and film-makers who create fictional narratives about the intimate dramas of historic people, giving them voices - such as this We Players production Roman Women - are regarded as seductive and engaging for the public. But they are not respected as expressions of scientific knowledge or legitimate interpretations of archaeological and historical data. For many years I have been challenging this lack of respect for creative imagination by exploring ways in which, as archaeologist-historian-writers, we can use our imaginations to celebrate the ambiguous nature of archaeological and historical evidence. We can conjure up sentient prehistoric and historic actors whose intimate lives are entangled with the empirical scientific data of archaeological excavations and historical documents, so that they are more than works of creative fiction by becoming starting points for further knowledge-making. 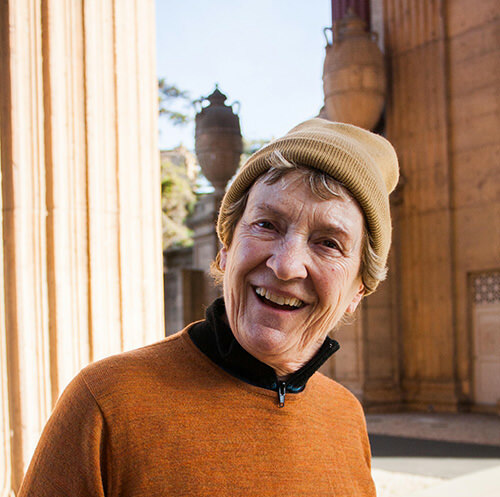 Ruth Tringham is an archaeologist who retired not so long ago as a Professor of Anthropology at UC Berkeley. Retirement from teaching has not stopped creative juices flowing. Currently she is doing research mentoring students as a UCB Professor of the Graduate School; she is also the creative director and president of a non-profit organization, the Center for Digital Archaeology (CoDA), and a director of Codifi, Inc a B-Corp developing paperless archaeology solutions. She is also practicing multisensorial archaeology as she develops a kind of computer game from her research that she will describe in her talk. Ruth is delighted to participate again in a WePlayers enterprise at another historic site in San Francisco. Ruth is not an actor, nor did she have any experience with stage production until she volunteered in spring-summer 2012 as a production assistant for We Players’ Odyssey on Angel Island. She worked with the company again at Fort Point in 2013 and 2014 as a guide to help the audience immerse themselves in the glorious contradictions and resonances between Fort Point and Shakespeare’s Macbeth. She has continued to work with We Players as an audience guide at the recent productions of Ondine, Midsummer of Love, and BEOWULF. She is interested in the clashes and harmonies between the past and present at historic places, which is why she loves to work with We Players and can’t wait to see how they will conjure up the Roman Women from a rather sparse documentation (especially according to Shakespeare). Lily Janiak, SFGate: Site-specific We Players goes classical with "Roman [Women]"
"Site-specific work this sensorial, this well done, is its own raison d’être"